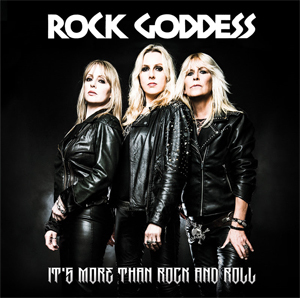 Legendary London trio ROCK GODDESS have released a music video for "It's More Than Rock And Roll", the song is the title track of the forthcoming EP, which is set to be released on May 19th, 2017. Digital distribution via Cargo Records and physical EP CDs, with a 4 page booklet in a jewel case by ROCK GODDESS directly. The first 500 copies will be signed and numbered. The video can be viewed on KNAC.COM HERE. The new EP It's More Than Rock And Roll can be pre-ordered digital HERE and physical, limited edition, signed and numbered, HERE. "It's More Than Rock And Roll"
In the early 1980s, ROCK GODDESS made a reputation for delivering songs with full frontal riffs, snapping rhythms and snappy melodies. That hasn’t altered. Since the three reunited in 2013, they’ve proven to be an energized, committed live band not reliant on past glories, but hell bent on the pursuit of an even more electrifying future.